I have read various accounts that determinate toms generally have a weaker root system (as above so below) and, given their reduced size, are generally weaker than indeterminates. This year was my first year really growing tomatoes in large quantities and it seemed to me that, yes, the indeterminates, although longer to maturity, tended to out perform the determinates. However, for the purposes of market gardening, the determinate tomatoes were more ideal for labor input, space requirements and generally a shorter time to yield. I haven't seen very many farmers growing determinates for market and judging by the many schemes for trellising greenhouse tomatoes, there seems to be a disproportionate advantage to growing indeterminates. It may be a "newbie" question but if determinate tomatoes really are doomed to a less-than fate then I might as well gear my tomato projects toward a more behaved indeterminate type. Re: Are Determinate Tomatoes Weaklings? The big problem with determinates is they don't taste very good. This is supposedly because they don't have enough leaf mass to properly feed the fruits. The leaf to fruit ratio isnt optimal. So it's mostly people who arent very demanding with respect to tomato flavor who grow them. Or are beginners. Or are growing tomatoes in pots. Or just dont want to do the work of supporting. I wouldnt call determinates weak necessarily. They are a smaller plant with a smaller root system that will yield only a small fraction of what an indeterminate plant will for the same cost in growing a transplant and transplanting. But determinates do take less space and arent as sprawling and unruly. If you are short on space, consider dwarf varieties rather than determinates. Dwarves are capable of prime flavor. They are actually just indeterminates with very short internodes. 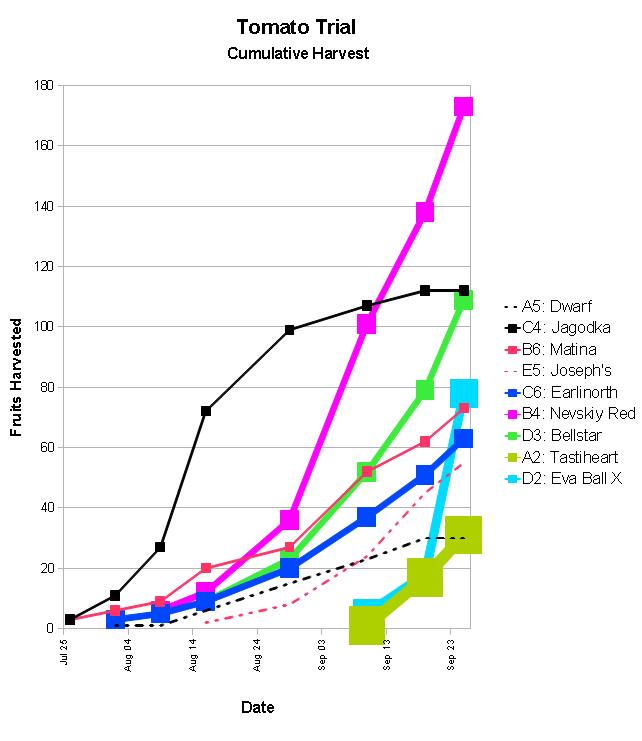 The Dwarf Tomato Project folks have OSSI-Pledged and released nearly hundred varieties. Reds, pinks, blacks, yellows, etc. See Victory Seeds for an excellent selection of dwarf varieties. I am interested in evolutionary breeding and in letting evolutionary and natural processes determine some of my selections. I also have a family tradition of growing only indeterminates which I broke at the online advice from the writings of Darrel Jones, Joseph Lofthouse, and in person advice from a local seed grower who produces seed for Silvery Fir Tree a determinate in 2016 and 2017. They argued for the merits of growing determinates in short season climates. Determinates can have a place in short season tomato growing. They ripen all their fruit and can be extremely short season. I was delighted in 2017 to find a number of ultra early varieties that can be reliably direct sown here in Montana. Most of these were determinate. This worked so well that now I am pondering harder question like "can they be direct sown and dry farmed?" From what I have read determinates usually do not do well dry farmed. I aim to test this and not simply accept it. If true my list of highly interesting extremely short season varieties can be shortened greatly and it would lead me to conclude that I don't want determinates after all. That they are as you say "weaklings" or perhaps from an evolutionary perspective "unfit" somehow broken and not adaptive after all. Though I have a lot of questions that have arisen from my recent experiments. 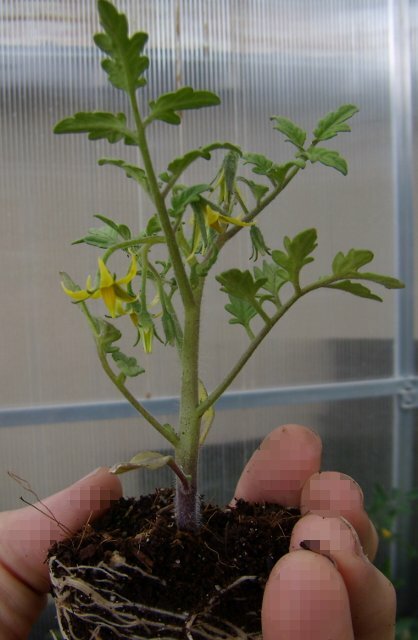 All tomato plants seem to be much smaller when subjected to torture like being direct seeded in dense populations, inadequate water, nutrients, etc. It however seems to me that large population sizes can replace the productivity of large individual plants. So it seems possible that direct seeded and dry farmed determinate tomatoes might be possible, but that greater densities may be necessary and perhaps possible because of their small size. So I think that deserves some experimentation before I abandon my recent experiments in determinate tomato growing. Carol mentions the dwarf tomato breeding project. That might be an alternative. Adaptive Seeds sells the shortest season tomato I've yet found. Sweet Cherriette which at 35 DTM is blazingly fast. It does this in part by being an indeterminate dwarf of some kind. This might be a more adaptive means to the same end as determinates. Or it might not, it deserves careful study in my opinion. In terms of healthiness the determinate plants can be as healthy as indeterminate ones. But since they stop growing at some point they do not have the same size of root system. That's good in pots and good to prevent bad splitting issues during heavy rain, but not so good when grown in ground with little water. During the last dry summer the determinate ones were struggling and had to be watered more frequently than the big guys, despite having less leaf volume to loose water. I found that very interesting, first time that we had so little rain to observe the downside of a smaller determinate root system. I have not noticed a huge flavour difference in det vs. indet. There are good and bad varieties, just like in indeterminate plants. But that might be my cool climate, where the big ones can't max out their full potential. Or it might be the excessively long days (15-19h of daylight during the growing season) where even the shorter and less leafy plants can do plenty enough photosynthesis. Or it might be that most of my determinates are potato leaf and also on the large plant side of the det spectrum at ~1,5m. Probably a combination of all three factors. Since I have built a taller greenhouse I mostly grow indeterminate plants with 2-4 stems per plant there. Using all 2,5m of precious head space and maximizing harvest in a short season by having more stems. 5 months are not much time and I start to remove new flowers in August, they would not grow to full size before frost comes. The determinate ones grow in my old little greenhouse or outdoors in pots under a roof. They fill a niche of growing space in my garden and it's nice they don't need a heavy duty trellis. I do not grow dwarfs at all anymore atm. I can't afford to let headspace go unused in the greenhouse and I can't grow tomatoes in the field with no shelter. It's too cold here and too rainy in normal years. I might try again at some point though. They could be suitable for hilled rows with low tunnels. My climate is dry dry dry. That means that many of the moisture loving diseases that afflict tomatoes in other areas simply don't get established here. Around here, there is no reason to trellis as a disease reduction technique. We have about 90-100 frost free days, a very short growing season. Therefore, in this area, market growers plant determinate tomatoes. Sure, by growing on the ground, more fruits are lost to insects, rots, etc, but there is zero labor or material costs for trellising and field clean up. The field perishment of fruit can be minimized by picking at first blush, and ripening fruit indoors. Outdoors, in my climate, determinates are much more productive than indeterminates, because determinates have already ripened their fruit by the time frost kills the immature fruits on the indeterminate plants. Determinate fruits taste better here, because a fruit that ripens during July's heat wave tastes better than a fruit that has spent the last few weeks of it's life shivering in September cold. About 4 determinate plants can be grown in the same space that one indeterminate plant requires, again leading to higher productivity on a per field basis. I really like seeing the huge trellised tomato plants in the yards of the hobbyist growers around here. They look fantastic! What I like even more, is eating tomatoes during July, August, and September. The hobbyist gardeners get to eat green fried tomatoes in September. I grow indeterminate cherry tomatoes, and indeterminate saladettes. 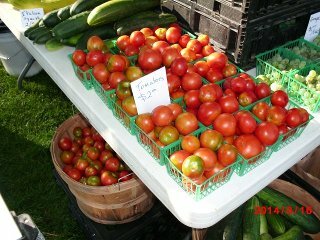 They are early enough that they contribute significantly to the market garden. In recent years, I have been enjoying exploring the possibilities of growing indeterminate tomatoes with about 3 to 4 ounce fruits. I expect that I'll be releasing a variety like that in the next few years. Something that starts flowering on the 4th leaf node, so that it will be early enough to be worth planting. I've been reviewing my records.... My frost free growing season is about 13 weeks long. On average, the determinates started flowering 6 weeks before the indeterminates. The indeterminates took 3 weeks longer for fruits to ripen after flowering. That makes the indeterminates 9 weeks later than the determinates. So the ideal indeterminate for me would start flowering very early, and would ripen fruit quickly. I grow an indeterminate like that. I call it Brad. 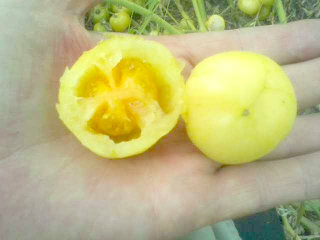 It is tied with Jagodka (determinate) as the earliest tomato in my garden. Brad is a slow/steady producer, while Jagoka produces more fruits earlier in the season. Too bad that I never made a Brad/Jagodka hybrid. I have been liking some of the indeterminate varieties that segregated from crosses I made between Jagodka and an indeterminate beefsteak. 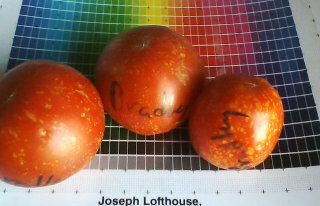 Brad got incorporated into the Beautifully Promiscuous Tomato project, and Jagodka is getting incorporated this winter. Fairy Hollow is a descendant of Brad. As a market grower, there is a huge premium paid for being first to market, and for fruit that is taken to market early in the season. Thanks for all the great input! Carol: I vividly remember the most delicious tomato I've ever eaten and it was a determinate called 'Glacier.' That being said, it was also the first non-cardboard tomato I had ever eaten so, perhaps, breaking that taste threshold had a bit of a biased effect on me. That variety must have something special going for it considering how quickly it sells out in seed catalogs. Luckily I was able to save some seed but the taste just hasn't ever been the same whether due to growing conditions or my own growing tastes. The dwarf tomatoes are something I have been eyeing up recently and it seems like they would be a great go-between for small vigorous plants. Thanks for the tip! As far as my brief research could turn up the dwarf tomatoes are also considered semi-indeterminate and the main gene for this trait (d) is interlinked with the determinate trait (sp), which are both recessive. I couldn't seem to find any information about crosses between determinate and dwarf plants though. Something else I could not find definitive evidence on is whether or not rooting habit is directly linked to the determinate trait. If the reduced leaf area of a small plant influences rooting that's one thing but if the roots of a determinate plant are actively "self pruned' like the above ground portion then I think that would be grounds for calling them weaklings. William S. I'm all about plant torture! And a dry farmed (or at least very low water use) tomato is basically what I would like to strive for. Although, all of that is very much a long haul project. I think that to develop dry farmed tomatoes the seedlings would have to have extremely vigorous roots to take advantage of available moisture. I've been playing around with that kind of seedling torture and, mostly. they just up and die. So far they just can't keep pace with something like wheat or peas. Otherwise, I think that the determinate habit seems to fit the bill for a hardy, fast, wind resistant dryland crop. I'm in the same skeptical boat as far as thinking determinates are all weaklings though! As far as your frost tolerant tomatoes go I think that determinates could have an advantage. This year I grew out a whole slurry of different varieties all mixed up together in the same field and when the first light frosts of fall came I noticed that the small determinate plants actually survived because they were hugging the still warm ground whereas the indeterminates were out for the count. The fruit and leaves close to the ground survived for at least 3 more weeks than the taller plants. So they are frost avoiding rather than frost tolerant. Yeah, Glacier has pretty good flavor. Notice that it has off-colored shoulders. That is, it does NOT carry the flavor-killing u gene that so many commercial breeders put into all their tomatoes. Stupice, which is my mainstay for early tomato, is just a week or so later than Glacier. It's actually a small indeterminate. The dwarf gene is not linked to self-pruning, the main gene that gives you determinate form. In catalogs, people sometimes call the dwarfs determinates, but this is not true unless they ALSO carry the self-pruning gene. Generally they don't. Self-pruning gives you a true determinate, that is, a plant that produces a certain amount of fruit and then the apical tips end in flowers and there is no further growth. Dwarf plants are actually indeterminates; they simply have much shorter internodes. But they keep on growing in indeterminate style. Dwarf plants all have a characteristic rugose foliage. I haven't seen anything specifically about the effect of d on the root form. However, my guess would be that it makes for shorter internodes in the roots too. Generally, bush form in the top of the plant is reflected in the roots. So, for example, I can pick out bush squash segregants by sprouting the seeds on paper towels in a way in which the seeds are all oriented so the roots can grow freely downward, and identify the bush plants by the bush roots. Dwarf tomatoes are great for small gardens and for growing in pots. They may or may not be early, depending on. Determinates have usually been bred specifically to be early. I've got a cross of Glacier and STupice. I'll grow it out next season and get plenty of F2 to distribute. There should be the potential for even greater earliness as well as frost resistance. That might be the ideal material for direct seeding. And Glacier and Stupice both taste good and taste fairly similar, so I'm guessing everything that segregates will actually taste good, whether determinate or not. I'm hoping the material will give some plants with a greater ability to thrive in cold weather. I'm envisioning breaking dormancy on the seed indoors by mixing it with moist potting soil and waiting for just long enough. Then spreading the potting soil in rows in wide beds and covering with plastic. All way before one normally plants tomatoes. That way I'd have hundreds or even thousands of plants to practice selection on. Maybe some without plastic too. Lots of possibilities. Anyway, the idea is to produce a lot of F2 seed so there will be plenty to share. I wonder if there is anything in the goop we ferment away when we clean tomato seed that helps germinating seed deal with cold spring weather. I used to grow Glacier and Stupice up until 2017 probably have seed still. In 2017 I tried direct seeding about 70 different kinds of mostly short season red tomatoes. In my opinion, for my climate, Glacier x Stupice F2 would fall short as a direct seeded population. After just two years of trying direct seeding I've moved on. 1. They are not the earliest material I've tried. Rather middle of the pack. I've rejected everything middle of the pack. 2. They are both red which to me has become substandard flavor wise. 3. They do not have high potential for late blight resistance which Carol has pointed out should be of high importance. 4. They lack any exotic coloration or patterns so don't have the potential to bring any of the modern bling into early tomatoes. So for my direct seeded tomatoes I guess I've already rejected Stupice and Glacier. They also did not show impressive cold or frost tolerance in my garden though in general that was dissapointing in almost all tomatoes. In my opinion no domestic tomato has these traits to a useful extent or nearly to the extent some of the wild species tomatoes may have. So in my opinion if you want a boring red tomato for direct seeding pick the earliest boring red tomato. Then cross it with something really useful like a wild tomato, a blight resistant tomato, a really wonderfully flavored tomato, a really wonderfully colored tomato. Try to find the shortest season version of those. Note: I doubt I have as good of an ability to distinguish flavor as either Carol or Joseph. In my attempts the lack of seed goop didn't seem to matter much. I've found that seeding about ten to twenty days before expected last frost works ok so far (but I have plenty of seed to replant with if needed). Inch high seedlings seem to have a better ability to survive a frost then taller seedlings. No useful difference between volunteering seedlings grown out of goop and seedlings direct seeded from seed with goop removed. I suspect that the goop helps keep the seed from germinating in the fall not the spring. Essentially it ferments away in the garden over winter just as it does in the seed saving fermentation tub. Though that is all observation based. Joseph I'm also in a very dry, short season, high altitude (7500') climate so your outlook is much appreciated. I did notice that the determinates I grew last year were much better tasting but there was only one ind. variety that made enough fruit to make a good comparison and that variety turned out to be an especially bad tasting paste tomato. That graph certainly tells a story in favor of determinates! How many of those determinates you trialed tasted good? (I'm familiar with your tomato taste standards and, after trying to eat through buckets of sub-par toms, I can definitely relate to being picky)! This sounds like an excellent method for pre trialing determinates (or dwarves) and picking out the more vigorous roots. William S May I ask what the varieties of determinates were that made the direct seeding cut? It was really easy to eliminate the industrialized "cardboard tomato" trait. A single taste testing of every plant in the patch easily eliminated that trait. (Like it's easy to taste 300 tomatoes on the same day!) After the cardboard trait was eliminated, I'm pretty sure that people wouldn't be able to tell the difference in a blind taste test between determinates and indeterminates. And for me, any tomato that ripens in July, or August, tastes better than a green tomato that is harvested mid-September. My favorite determinate tomatoes send out additional shoots from the leaf buds, so even though the central stem stops growing, there is a continuous flush of new stems that are emerging and ripening fruits. Jagodka (Earl's strain) actually just tortured a transplant of this variety but pretty confident. Grew a plant of Josephs Ot Jagodka strain in 2018 along side a child of Earl's strain. It was a bit later and more round, looks rounder than the Jagodka on Tatianas tomatobase in pictures on the Internet as well. Top Indeterminate varieties for earliness when direct seeded. Probably the tomato Joseph calls "Brad" but I actually grew it from transplant in 2018 so may direct seed a bit of it in 2019. Of these Sungold and Coyote have the best flavor. I suspect Joseph's Big Hill will be a good short season addition for flavor breeding. It's pretty early and a bicolor. Not all bicolors I've tried have been equal, but they've all been better than reds. I'm hoping for a Big Hill x Blue Ambrosia hybrid in 2019 just from interplanting the two as they both have flowers that should have higher out crossing rates. I am able to direct seed longer season tomatoes, but I think the shortest are going to be most reliably productive here. I think in a good tomato year like 2017 I could direct seed any tomato that will reliably produce from transplant. In 2018 I got plenty of seed back, but no huge harvest from my direct seeding. In 2018 I didnt direct seed my earliest finds, I direct seeded an variety called "Blue Ambrosia" that was moderately early in 2017 but was fancy and had exserted stigmas. It did produce a lot of F1 hybrids in 2018 so I'll have F2s from it in 2019. William, there are some heritage varieties from southern Italy that are supposed to be adapted for dry farming.have a search for pomdorino inverno puglia and use google translate - I haven't time to work through them all at the moment, but there was mention of low input tomatoes from the coastal villages of Puglia not being irrigated. I sell some seed, but imagine your access (in North America) to the originals is much greater than mine.